Constant high pressure, temperature, vibrations and external contaminants such as oil, fuel and acids cause the Machinery Surface Lining to fail without there being any issues with the Machinery itself. Above visual impact, refinishing an Engine, Genset or Engine Room also allows for the effective management and maintenance of your machinery. A dirty engine or engine room hides many issues that can generate major machinery failures. We are able to degrease, clean and re-coat any fixed or moving piece of machinery, machinery parts or spaces to prevent and identify any early signs of possible issues. 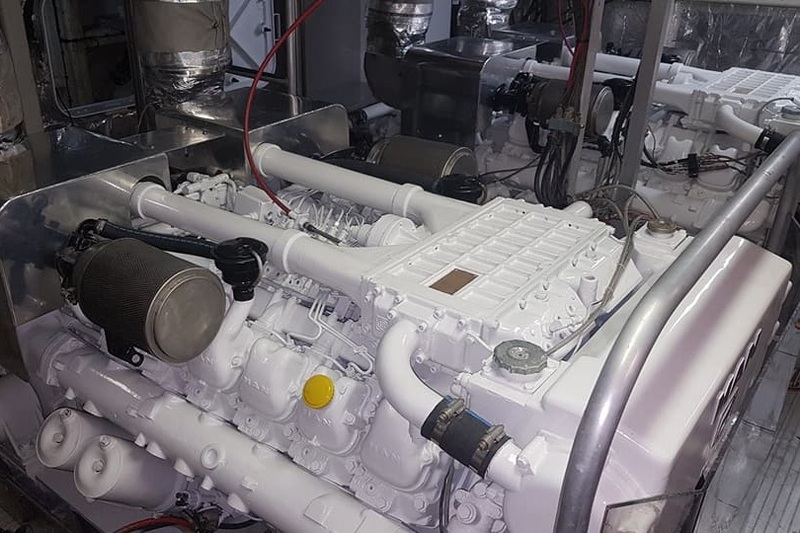 We use high velocity soda blasting or air powered abrasive methods to remove deteriorated lining from any part of the engines, gensets or other machinery, followed by a 3 step refinishing process with the customers desired colour. If just cleaning is required, we use high pressure steam in combination with applicable chemicals to remove any kind of contaminants. All residual liquid is also disposed, leaving areas dry and ready for survey or hot works.